Summary: How to set up throttle bodies and idle mixture on the 996R and 998. And 748R too, which are somewhat the same. Photos from Phillip at Two Wheelers in Griffith. The 996R and 998 use a unique set of throttle bodies (although the 748R is similar) with shower injectors. 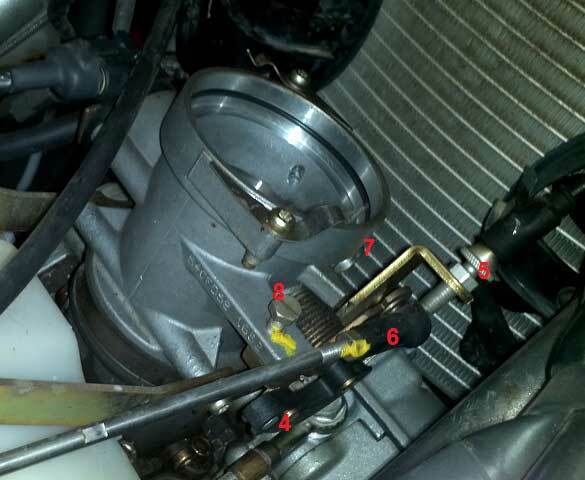 The photos below show the features of these throttle bodies. In the photos you’ll notice I’ve numbered all the parts we need to know about in series across all the photos. That way, if I give a number, you know which part I mean. 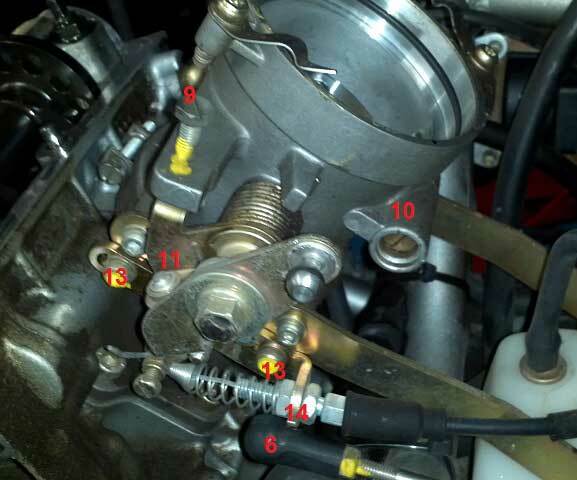 Items viewed from the LH side on the horizontal throttle body. Ducati call it the master. 2/ TPS adjustment screws (only one visible), usually T20 torx. The TPS (1) is the small PF3C Non Linear part used on the 2V models from ST2 onwards in addition to the 748R, 996R and 998. Items viewed from the RH side on the horizontal throttle body. Items viewed from the RH side on the vertical throttle body. Ducati call it the slave. Although it is hard to see in the above photos, the throttle body balance adjustment set up is a hex head screw (7mm) with a flat blade slot accessed from underneath. You can see the end of the screw numbered. 748R: The 748R doesn’t have # 11 to 14. The throttle linkage adjustment is done by loosening the little nuts and rotating the rod, which has a left hand thread at one end and a right hand thread at the other. It’s as frustrating as it sounds. Fast idle is done with the little button at the twist grip, like all the other 748  996 models. The fast idle actuating lever is obscured in these photos, but if you look directly from the side you can see the ends of the slot in the fast idle lever and the boss that stops it. This means the ends of fast idle lever (12) travel are constrained, and this needs to be remembered when you adjust the cable (14). There’s no point adjusting the cable so the lever doesn’t move, as the adjustment for when the fast idle arm starts opening the throttle bodies themselves is controlled by the fast idle lever (13) adjustment, which is done by undoing the two screws (13) and sliding the assembly forward or back, depending on whether you want more or less. As such, adjusting the fast idle lever (13) can be a little tricky, and realistically there’s not much point, as below. 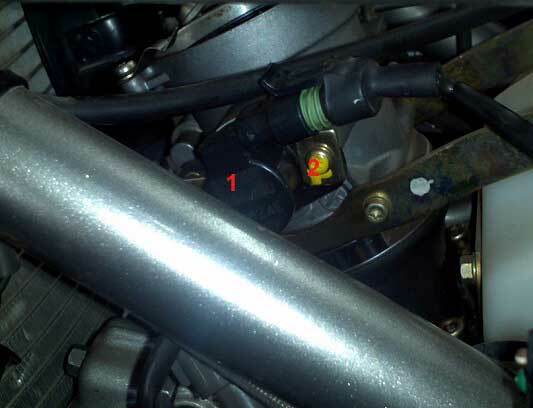 On the 996R they went to a fast idle cable, but this cable acts on the vertical throttle body. The throttle cable acts on the horizontal, so when you open the throttle cable you open the front throttle, then take up the free play in the throttle rod, then open the vertical throttle. So when you set the running balance (sync for the Americans) by holding the throttle open, all the free play is allowed for. But when you pull the fast idle lever on, the above action is reversed and so the free play is introduced as an imbalance. The means the vertical throttle is open more than the horizontal. As the TPS is on the horizontal throttle body, the vertical is open more than the ecu expects and so will run leaner than the horizontal. All of which is not conducive to reliable cold starting. It’s a completely stupid design, and it’s why most 996R and 998 will start from cold better without any fast idle and with the throttle closed or opened a little at the grip. Preparation: you need to get to the top of the throttle bodies to wind out the stop screws and disconnect the linkage rod ends, so you really can’t do this unless the air box is removed. Removing the air box on these involves removing the trumpets with the injectors and fuel hoses built into them. Be very careful not to crimp the plastic fuel lines when twisting the trumpets. Remove the wiring to the injectors first, and don’t pull to hard on the connectors, as you can pull the plastic centre out of the steel body. When you lift the air box out you need to feed the wiring and it’s grommet down through the hole in the base. You can leave the fuel lines in the air box base, but one of them usually gets hooked under the vertical throttle body tabs. So when you’re pulling upwards on the air box and it just won’t come out, remember this. And the drain hose at the front LH of the base. Every step is as important as any other, and the predominant aim of this procedure (apart from being “correct”) is repeatability and consistency. I normally do it with the engine and throttle body cold. This is simply the convention, I do it hot if I have to. Disconnect the throttle cable at the throttle cable wheel (4). Easiest to just take the cable out of the wheel rather than play with the adjuster. 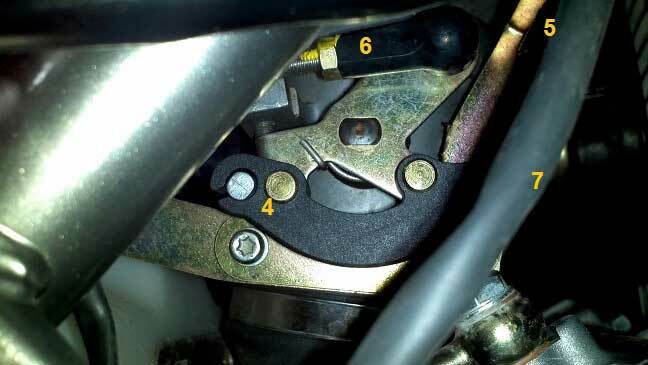 Disconnect the throttle linkage rod (6). You can pop off the plastic connector at either end. I use a pair of side cutter pliers with the taper side against the throttle cable wheel side  it pushes the plastic connector off nicely. Disconnecting the throttle linkage rod (6) removes the dumb arse fast idle system from having any impact. Connect to the TPS by whichever method you are using to measure the TPS output voltage  back probing wires, Mathesis, DDS, etc. I think you need to go into the outer two wires if back probing. Given the connectors fitted to the 5.9M ecu, back probing at the ecu can only lead to much agro. With the throttle closed before you start you should be seeing voltage in the range of 350  450 mV, depending on who’s been there before you. I usually record this voltage, just in case I need to go back to it. Remember, you need to have the ignition on when doing this, and you don’t want to short out any wires. Disconnecting the headlight or removing the headlight fuse can also be a good idea if you don’t have a "lights on/off” switch. Back off the horizontal cylinder idle stop screw (8) to allow the throttle butterfly to close fully and jam if snapped or pushed. These screws are 8mm hex. Open and close the horizontal throttle butterfly gently until the voltage stabilises at a minimum. Do not snap the throttle butterfly shut, as this will jam the butterfly and may give a false lower voltage reading. Usually the voltage at this point will be in the range of 90 to 170mV, most likely around 100. Again, I usually record this voltage out of suspicion. Once you’ve ensured the horizontal throttle butterfly is closing properly, reset the TPS to give an output voltage of 150 mV by loosening the two screws (2) and rotating the TPS as required. These screws are usually T20 torx head. Tighten the two screws (2) and ensure the setting remains consistent. Wind in the horizontal throttle body stop screw (8) until the TPS output voltage is around 390mV. The specified idle setting for the 748R is 2.2 degrees and for the 996R and 998 is 2.3 degrees, which theoretically equates to 380mV and 390mV respectively. I always use the throttle angle the ECU is reading to set the “base idle” setting, as what the ECU is reading is more relevant than the actual voltage, as there is always variation in the relationship between them. However, you need some sort of diagnostic tool or software to read the throttle angle, so for many the voltage is as close as you can get. It’s still quite valid. Open and close the throttle a few times to check the idle setting is stable and adjust if required. The TPS is now set and the horizontal throttle body stop screw (8) should not be touched again. Reconnect the throttle linkage rod (6). Remove the vertical cylinder idle stop screw (9) and turf it. This way, the throttle linkage rod (6) is loaded by the vertical throttle butterfly all the time and free play is not an issue. Reconnect the throttle cable to the cable wheel (4) and set the free play in the cable. You can do this at the throttle body (5) or the twist grip, up to you. On the 748R the free play sets the fast idle speed with the button pressed. Turn the bars fully left and right while doing this just in case the cables move when doing that. Refit the air box and fuel tank. You can get to all the adjusters you need to from the RH side, though they can be a bit fiddly. Start the engine and get some heat into it. Wind the air bleeds (7, 10) fully in. Again, I record how far out they were, just in case I need to go back to where I started. You will need the fast idle on to get the engine to idle, but remember it will be unbalanced. 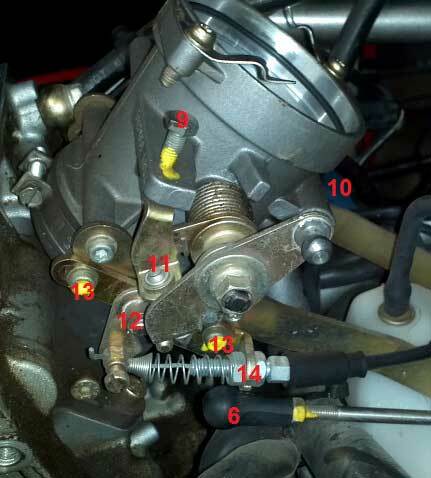 Set the running balance (synchronisation) via the throttle linkage adjustment screw (11) using mercury sticks, etc at various RPM. But remember to raise the rpm by holding the twist grip open, not using the fast idle lever. This is often a case of best compromise, and remember that cruise at 4,000 RPM has more throttle than free rev at 4,000 RPM. I usually go up to 6,000 or so RPM free revving to check for variation. It’s not uncommon to see one cylinder lead then the other lead at differing RPM. Remember the word “compromise”. Next set the idle speed using the air bleeds (7, 10) as required. Set the idle speed at approx 1100  1150 RPM once the engine is hot. There is no general rule for how far out the air bleeds should be, although I find the 748R will be nearly closed. At this point most will set the air bleeds so the cylinders are balanced at idle. I don’t worry about vacuum balance at idle though  we balance the mixture using the air bleeds and idle trimmer, as set out below. That’s the end of the throttle body fiddling. Next is the setting of the idle mixture. I often say to people that if they can’t carry out this final step then all the previous steps may have just been in vain. You might get lucky and be close. Or not lucky and still have a poorly idling or running bike. The idle mixture can have a very large impact on general running at low throttle openings. For example, if the bike is too lean and idles low, winding out the air bleeds (7, 10) to try to raise the idle speed will only lean it out more, so the idle will most likely not increase. You can sometimes make a bike idle better by winding the air bleeds (7, 10) in and richening the idle mixture if it was too lean to start with, even though the idle is low. As an indication based on experience, a full turn on the air bleeds can change the mixture from 1% CO to 4% CO, so the air bleeds have a big affect. I use 4% CO as the idle mixture target for the 748R and 5% for the 996R and 998. This tends to work well and give good low speed running and fuel economy. It's a bit leaner on the 748R to try to stop the off idle hiccup that they often have with Ducati based eproms, although because the problem isn't really fueling related (it's more ignition advance) it's a bit of a badly applied band aid. Take a sample from both header pipes using the little 1/8 gas threaded bungs. You can buy from Ducati a tube to go into this bung  it’s a piece of copper pipe with the appropriate fitting on the end  that is surprisingly cheap. You could also get some made up by a local hydraulics supplier. I have a few of varying lengths and bends for all occasions. Given there is only one idle trimmer for both cylinders, I check the mixture and then adjust the trimmer to get the average between both cylinders where we want it. Then I adjust the air bleeds to give the same mixture in both headers. This means that the manifold vacuum balance or synchronisation at idle will often not be equal. That’s just how it is. Equal mixture CO% is more important in my experience. The idle trimmer is a trim pot inside the 1.6M ECU, which is under the seat. 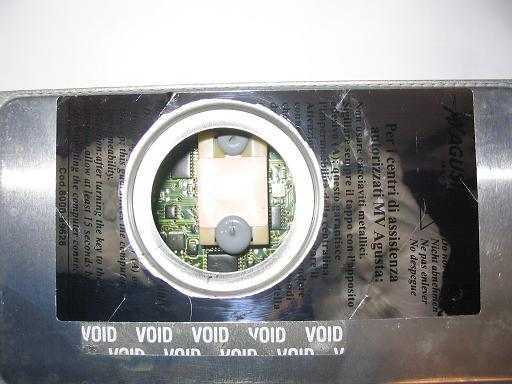 The 1.6M ECU has a rubber access plug that is hopefully hidden under a “do not remove” sticker of some sort or some race tape if someone has been in there before. 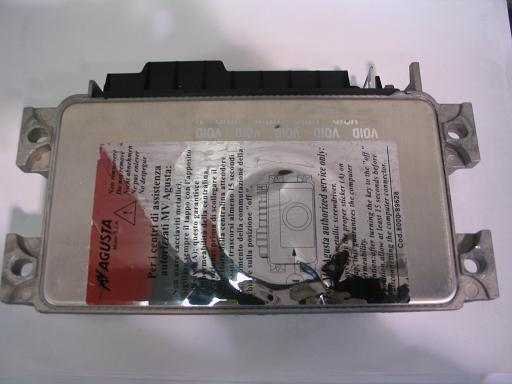 Once you’ve finished, cover the plug again  they can leak water into the ECU if you leave the plug uncovered. Either remove the whole sticker, tape, etc or just use a sharp knife/blade to cut around the plug and gently pry it out with a little screwdriver. Once removed you can see the eprom directly under the access hole. The idle trimmer is a little metal square just next to the eprom with a plastic rotating pot inside. This adjusts the idle mixture, working the same as the electronic idle trimmers in the 1.5M and 5.9M ECU. It adds or subtracts a given pulse width from the map fuel number across the whole map, therefore having a much greater percentage effect at small pulse widths. This trimmer is adjusted by rotating it between the ends of its travel. The total travel is 270 degrees (3/4 of a full turn) as shown in the next photo so if you manage to make it go all the way round you’ve wrecked it and it’s time for a new ECU. Be very gentle! 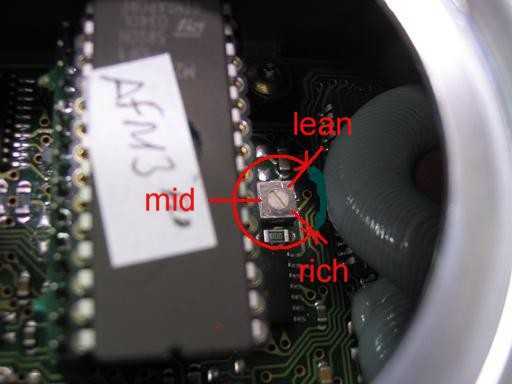 As with a mixture screw, clockwise is lean, anti clockwise is rich. 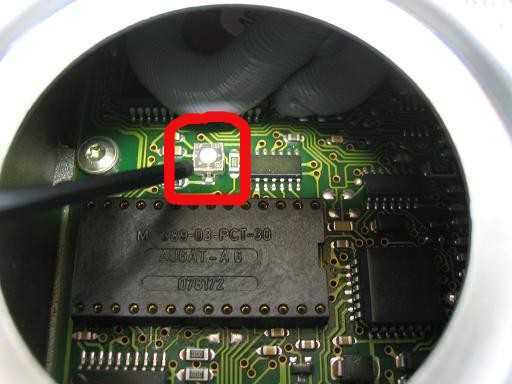 The mid point, where the trimmer slot points directly at the eprom socket, is nominally zero. Best to use a non metallic screwdriver when adjusting this especially when you have the engine running and the ECU circuit board is live. You don’t want to be shorting anything out. In the photo you can see the trimmer is set at about 60 degrees lean (which looks identical to 120 degrees rich, unless you look really hard and can see the little dots that act as arrow head edges). If you don’t have a gas analyser, as a bit of a rough guide, I’ve found that the best way to set the idle mixture is to move the trim pot slowly clockwise (leaner) until the revs begin to drop. Then go richer until the revs begin to drop. Now you have these two end points, set the trimmer 1/3 of the way from the lean stumble point towards the rich stumble point. This usually gives 4% CO when I’ve tried this method and then checked with the gas analyser. There is no default or ideal setting for the trim pot (except for the ones I specify as guides for my eproms), just wherever it ends up. You can manipulate it somewhat with air bleed position if you need to, and it can have quite an impact on low speed running and fuel economy. And it does act over the whole fuel map, so can affect WOT running too. The idle trimmer on these models is adjusted electronically via diagnostic tools or software. There is no way to get around it. Mathesis, DDS, Technoresearch Centurion, Navigator, etc. There is no default or ideal setting for the idle trimmer, just wherever it ends up. You can manipulate it somewhat with air bleed position if you need to, and it can have quite an impact on low speed running and fuel economy. And it does act over the whole fuel map, so can affect WOT running too.